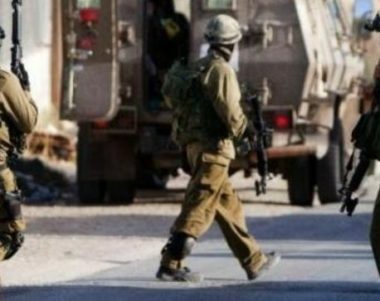 Israeli soldiers abducted, Tuesday, a former political prisoner from Doura town, southwest of Hebron in the southern part of the occupied West Bank, and installed many roadblocks in several parts of the governorate. The soldiers also abducted one Palestinian near Qalqilia, in northern West Bank. The Hebron office of the Palestinian Prisoners’ Society (PPS) has reported that the soldiers abducted a former political prisoner, identified as Odai al-‘Awawda. It added that the soldiers violently searched the home of the abducted Palestinian, and interrogated him along with his family, before taking him to an unknown destination. In addition, the soldiers invaded many neighborhoods in Hebron city, in addition to the nearby towns of Tarqoumia and Beit Ula, and installed roadblocks on the northern and southern entrances of Hebron city, along with main roads of Sa’ir and Halhoul towns. Furthermore, several army jeeps invaded ‘Izbat Salman village, south of the northern West bank city of Qalqilia, and abducted ‘Obeida Salman, 26, from his home, after violently searching it. In Salfit, in central West Bank, the soldiers invaded a gas station at the eastern entrance of the city , and confiscated surveillance recordings after searching it. The army claimed that several shots were fired at a colonist’s car near Ariel illegal colony, built on Palestinian lands. The soldiers also surrounded several villages in the area, and stopped dozens of cars.